Just before 5pm, as I have done countless times since 2007, I arrived at one of my regular dinner haunts – Pizza Hut, 630 George Street, Sydney. One of the staff who knew me and served me made a stunning announcement. Tonight, Pizza Hut 630 George Street was closing down. That was stunning, and sad, for several reasons. One, I had been visiting 630 George Street since 1987 when I was 16-17 years old (and in late 1993 I also enquired about a job there, but they weren’t hiring). Two, since 2007 I had been visiting 630 George Street at least once a week, and many weeks more than once. Three, since Black and Blue Man began in 2010, 630 George Street is where most of it was written. I began dining out most nights in 2007, partly because I simply enjoyed it and partly because I preferred to do creative writing in public places rather than in the isolation of home. As well as creative writing, I also came to like 630 George Street as a place to work. Up until 2010 when I began working from home full-time, I would leave the office early, arrive at 5pm to have an early dinner, and then at 6pm power on my laptop PC and complete my last 1-2 hours (or more). Even after I began working from home, though, I continued this routine at 630 George Street and other places. By 2010, my interest in creative writing had waned – but I still wanted to write somehow, and that’s partly how Black and Blue Man came about. Soon, Saturday became ‘blog night’, and has mostly remained so ever since – and because I could stay up to 5 hours at 630 George Street on Saturday nights, it became my usual ‘blog place’. So as I said above, Black and Blue Man was mostly written there. (This post is being written at another favourite haunt only a few doors away on George). That last night at 630 George Street, I was told that there may be plans to re-open somewhere else in the city. If they do, of course I’ll go and see what it’s like – but, an almost 28-year era of my life is now over. Pizza Hut 630 George Street – and especially the staff who worked there since 2007 – thank you and all the best. I have just returned to Sydney after living away.This is terrible news, I was hoping to catch up with friends there. Any word if they are are reopening somewhere else? I still look online every now and then for any news, but so far nothing. I was a regular there too. I probably saw you a trillion times as well. I was devastated when I found out they were closing. Like you, I used to actually stop there to ‘work’. My first published manuscript had its start there, and I would often turn over ideas or type or the like during a meal. Still, I can but hope. I see what you mean about the dine-in section. 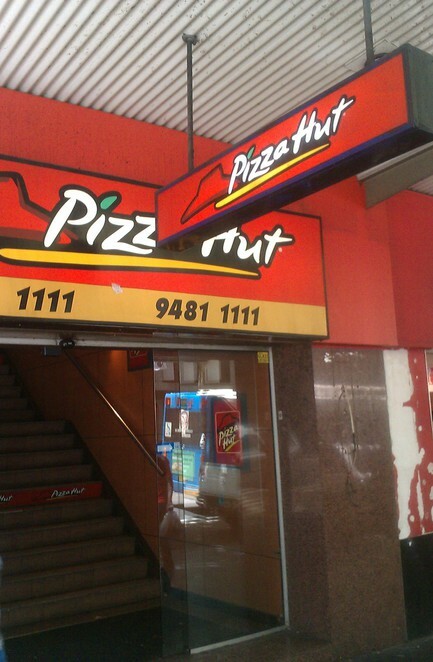 As well, the only other dine-in Pizza Hut I knew of and went to in recent years was way up in Gympie, Queensland – and it doesn’t appear to do dine-in anymore, either. I drove past a dine in Pizza Hut in Windsor (Western Sydney) today. There’s also one at Minto. yes, the staff were nice. they let me eat the pizza topping and throw away the crust. never complained. but the chocolate mousse was my favourite. and the view was nice too. George st will be changing a lot in the next few years with trams.